The 13 people arrested for the October 5th murder of four students of the University of Port Harcourt were meant to appear in court yesterday Thursday December 20th but the trial was stalled due to the failure of prison officials to produce them in court. At the resumed hearing yesterday morning, the prosecutor told the court that the accused persons were in the court cell, but could not be brought in because of shortage of prison personnel. Yes, they actually said that! Shortage of prison personnel? Does that even make sense? The prosecutor also said he was yet to receive any advice on the matter from the Director of Public prosecution to whom the case file was referred. The case was then adjourned till February 28, 2013. The suspects were remanded in prison. Meanwhile the police has arraigned three more persons for the brutal killing of Tekena, Iloyd, Ugonna and Chiadika. 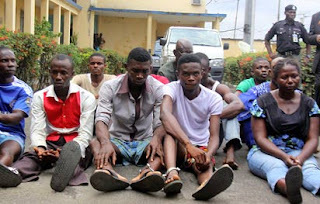 They are: Finebone Jeffrey (23), Joshua Ekpe (27), and Abang Cyril (27), all arraigned on a five-count charge of conspiracy and murder The NBA chapter in Port Harcourt, who sent representatives to the trial yesterday, demanded access to the case file and the court ordered the release of the files to them.